A coloring Bible may make a lovely gift for the right recipient, but is it the best choice for reading and studying? The main purpose of a Bible is to read it, not design or decorate it. There’s nothing wrong with getting creative with the text (in decoration, that is, not interpretation), as long as it doesn’t distract from the text. Before your child starts gleefully coloring, careful consideration must be given to the medium. Thin pages not appropriate for standard markers; small designs not appropriate for crayons. The only acceptable medium is colored pencils, preferably art pencils, which are slightly softer and render a more brilliant color than the standard colored pencils sold in the supermarket aisle. These might be so soft as to rub off on facing pages, so instead of a beautifully designed text the owner could end up with a smudgy mess. Be sure to purchase the right kind of pencils to go along with the Bible. 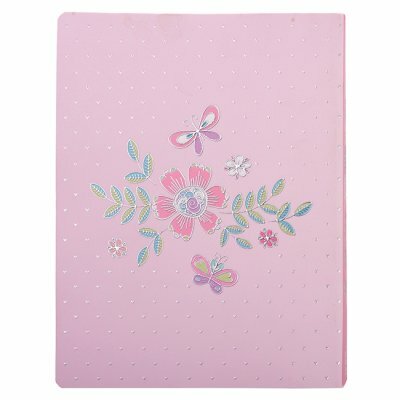 Flower-and-butterfly designs predominate, with swirly calligraphy and some animals or people swirled in. The effect is overwhelmingly girly, which may get to be a bit much over time. This undeniably feminine edition, available in a wide variety of lovely covers, attempts to have it all: journaling margins, many with journaling prompts, “fun facts” lists, over 300 devotional readings by Carolyn Larson, 500+ line-art illustrations to color, including 64 designed key verse pages. The introduction includes some helpful material such as journaling tips, questions to ask as you read (mostly application), a 45-day “Shine Brightly for Jesus” Bible reading plan relating to devotionals scattered throughout the text. Each book begins with a one-page introduction featuring key verses and fun facts. With so much additional material, the page number is extensive and the font is necessarily small. Mainly for that reason, though this edition is marketed to ages 8-14, I would put the age range higher. 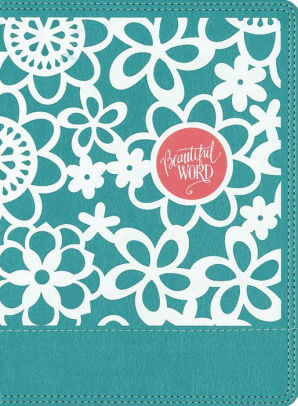 Intended for a slightly older age group than the Wonders of Creation Bible we reviewed last year, Beautiful Word for Girls follows Beautiful Word (for grownups) and Beautiful Word for Teens, with very similar designs and format. The single-column pages feature wide journaling margins as well as coloring margins, with well over 100 full-page designed verses. There’s little in the way of study helps or introductions; as far as text goes, this text is strictly for reading (and doodling). The paper is slightly heavier, which may facilitate coloring in other media besides art pencils, and the binding, as in most coloring Bibles, is designed to la flat. But there’s a tradeoff. I couldn’t find a statement as to font size, but it seems unusually small—less than 8 point. The type size is a frequent complaint in the Amazon reader reviews, as well as the weight of the book Unless your young students want to build up their muscles, it may be wiser to choose a more standard Bible for reading and studying and find Christian coloring books to scratch that particular itch. The younger age recommendation is owing to some of the designs: the teddy bears, cuddly animals, and smiley-faces that appear in many of the line drawings will have limited appeal for older kids. 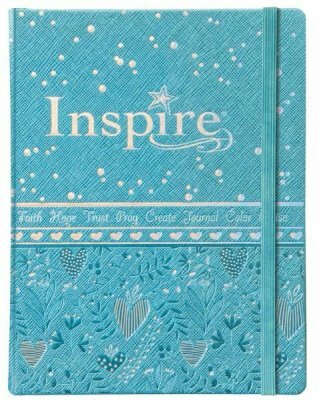 Marketed as a gift Bible, the one-column design features two-inch margins for journaling or coloring. The journaling columns are mostly blank, leaving it up to the reader to make comments or doodles. Full-page features include one key verse before every book and to profiles of Women of the Bible. 366 short devotionals by Amanda Cowles are scattered throughout the text. The appendix mostly consists of indices of devotional topics, character profiles and designed verses (both full-page and margins). The comfortable type size and simpler designs make this more suitable for pre-teens and younger..